Most businesses need a credit card of some time, if you don’t you’re throwing money away that you could be investing back into the company from everyday purchases. You don’t really even need to get a fancy card with high annual fees to get a good return on your investment. Our first business credit card was the American Express SimplyCash Plus, it was exactly what we needed, offered good cash back value for no annual fee. For businesses just getting started or with those who don’t have a lot of expenses where a more premium credit card is needed this card is the perfect fit. It’s cash back categories saved us lots of money on phone bills and internet services. Its 5% category is generous by including both office supplies and phone bills, two services that we buy from a lot. With the choice of a 3% category of your choice we picked internet services with it being our biggest expense every month. This card is a great card if you’re interested mostly in the cash back aspect of credit cards and don’t want to fuss with credit card points or miles this is perfect. 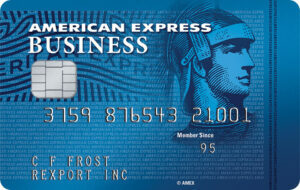 American Express enables you to have some powerful cash back categories that makes this card very useful. That being said American Express is accepted most everywhere but there are still some smaller places that do not accept the card issuer which means you could run into some issues. From my personal experience I’ve yet to find someone who doesn’t take American Express. For small businesses with very little expenses and interested in cash back the SimplyCash Plus is a perfect card.